Food is part of our workplaces. Think about celebrating a coworker’s birthday with a freshly baked cake or journalists ordering piping hot pizza on election night or even office potlucks with homemade dishes during the holidays. Each of these small moments in life are marked by the food we consume during them, as are many parts of our culture. But some foods are even more deeply intertwined with a place through its connections with the industry that supports it. In fact, in some cases, a food’s very existence is because of a specific industry, at least that’s true in Appalachia. In this region, many workers found themselves in blue-collar jobs and that affected the types of food they could consume during the lunchtime hour. At dinner, options are limitless. You have the luxury of a stove and fresh water. You can bake fresh breads and simmer beans and keep dairy cool. But, lunch served a different purpose. It had to hold up to a hard day of work and fill a growling tummy. Many had to ask themselves: what could go without refrigeration for 12 hours? What is portable and could be taken on the road? What could be filling and quick to eat? A few foods were born from these restrictions, foods that continue to be heralded as some of the best in Appalachian culture. They were the result of fitting an industrialized lifestyle while also serving as a reminder for workers of their heritage and homes during the work day. When Italians emigrated from Calabria, Italy, to North Central West Virginia to work in the coal mines, they brought traditional foods with them: fresh pastas, breads, cured meats and more. It was common to see pieces of bread and salami in lunch buckets underground in the late-1800 and early-1900s. Sometime in the 1920s, it’s likely that the wives of coal miners first began to tinker with what we now know as the pepperoni roll. It was sometime between 1927 and 1938 that Giueseppe Argiro, a former coal miner, baked bread rolls with sticks of pepperoni inside them for commercial purposes. That’s when the pepperoni roll was presented to a large audience. The pepperoni roll transformed lunch for miners. It became a portable, shelf-stable snack that allowed them to eat with one hand and drink water with the other before rushing back to finish their long shift. But the pepperoni roll has become more than just a symbol of the history of this community largely because it is a culinary gem in its own right. When the freshly cut pepperoni bakes inside the dough, the oils and herbs and spice seep into the bread, creating a flavorful, hearty snack. 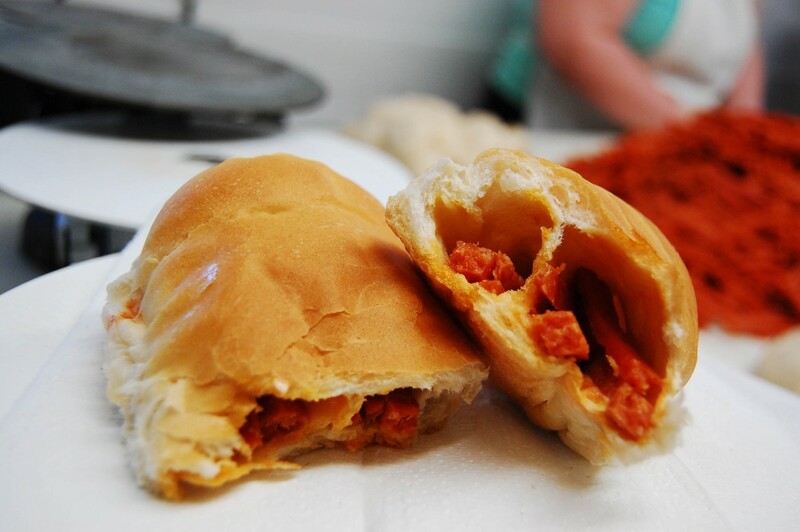 Italians – as well as other communities – enjoyed the pepperoni roll as a treat. Many of the reasons for its success in the coal mines continue to persist today. Its ability to be shelf-stable and portable make it perfect for tailgating, road trips and even in today’s school cafeteria lunches. Variations of the pepperoni roll have developed over the past nearly 100 years. First, by using slice pepperoni that is wrapped throughout the whole roll and then integrating cheese – often mozzarella, provolone or pepper jack. Recent iterations have included sauce, jalapenos, used ground pepperoni or have even been deep-fried. The pepperoni roll lives on in Mountain State bakeries, restaurants and gas stations. Though most people will still say the best ones are from their grandmothers’ kitchens. The famous Primanti Brothers sandwich, created in the Paris of Appalachia, fed workers of a different industry: steel. Local legend claims that the sandwich, which is piled with French fries and coleslaw on the inside, was created for steel mill workers dating back to the 1930s at the Pittsburgh restaurant. It allowed for rushed steelworkers to quickly eat their entire lunch – sides and all – in one go, according to food magazine Saveur. The towering sandwich includes a meat, provolone cheese, thick-cut French fries and vinegar-based coleslaw all stacked between two slices of Italian bread. And while the details are murky (with others claiming it was created for truck drivers), the lore of this American sandwich is widely known and celebrated. Unlike the pepperoni roll which has largely remained a West Virginia delicacy, you can eat a Primanti Brothers sandwich with fries and coleslaw everywhere from Pennsylvania to Florida and dozens of restaurants in between – and when doing so, you are consuming part of the history of the city. Both the pepperoni roll and the Pittsburgh sandwich share a common concept: food made by and for immigrants. The story of Appalachia is a story of immigration and diversity and that is reflected in the foods they ate, but also in the containers constructed to allow the people here to eat them. As more Americans began shifting to industrial work in factories and mines, it no longer became feasible for the average man to return home for a hot lunch. Rather, he needed something to transport and protect those pepperoni rolls and Pittsburgh sandwiches. Since the 19th century, workers carried their lunches in heavy-duty tin or aluminum pails that could weather the rough atmospheres workers endured, according to the Smithsonian Magazine. In fact, it was a miner who created the aluminum variant after he accidentally crushed his tin lunch pail, according to Sudbury Mining Solutions Journal. The pails themselves were signifiers of class; the wealthy could afford the luxury of time to return home mid-day or wealth to purchase food elsewhere, while those on the lower end of the pay scale could not. Later came the Thermos, a durable beverage container that kept hot beverages hot and cold beverages cold until lunchtime. These two products together enabled workers to maintain a piece of their culinary culture while putting in long hours away from home. It kept the foods they cherished safe in an otherwise dangerous workplace, and that was almost as important as the foods themselves. Food plays an important role in Appalachian culture, and by extension, how we earn a living. America knows beans & cornbread, wild game, ramps, buckwheat and many more are traditional Appalachian foods, but there is something unique about the foods Appalachian workers chose to get them through a long day, and those foods born from this lifestyle. Pepperoni rolls and Primanti Brothers sandwiches are just two examples of how creative Appalachians were able to transform comfort foods into lunch staples that reflected their culture and heritage, but this concept translates to a larger scale and tells us more about Appalachian identity. As people immigrated to the region in search of work, the foods, the customs, the arts and the values they brought with them came together to help create Appalachia’s identity, much of which is centered around the concept of hard work. These immigrants left their home countries in search of a job, and they found it in the form of difficult, physical labor. These jobs were often so demanding that the only breaks the workers had during the day were those lunches – and even then, they did their best to make it a very quick one with the invention of these portable, easy meals. The people of the region have made difficult terrain work for farming and adapted their cultural dishes to accommodate foods available in the region. They have used parts of animals that would have historically been thrown away as rubbish. They have transformed goods from simple ingredients to full-fledged meals with minimal budgets. Appalachians are industrious and resilient. They are down-to-earth, creative and resourceful. They are steadfast, hardy and determined – in all aspects of life. They are innovative and always willing to take on a challenge. It is only fitting those qualities are reflected in the food they consume. Pepperoni rolls and Primanti Brothers sandwiches are not merely foods created for Appalachians; they embody what it means to be an Appalachian. Candace Nelson is a marketing professional living in Charleston, W.Va. She is the author of the book “The West Virginia Pepperoni Roll” from WVU Press. In her free time, Nelson blogs about Appalachian food culture at CandaceLately.com. Find her on Twitter at @Candace07 or email CandaceRNelson@gmail.com. “Food is political but not partisan.” This apt perspective came from Mike Costello in a conversation earlier this year as we imagined ways to expand 100 Days in Appalachia beyond political coverage, and he joined the team to lead our reporting on food and culture for the region. Mike has long been one of my favorite Appalachians — a printmaker, fiddler, storyteller, satirist, photographer, square dance caller, restorator, entrepreneur, food historian, gardener, forager, hunter … and brilliant chef. Mike is co-owner of Lost Creek Farm with his partner, Amy Dawson, and has led pop-up dinners throughout the region as a form of place-based, cultural performance. His storytelling dinners are so much more than meals, and we know his work for 100 Days in Appalachia will be about so much more than food. The rest of the world will get a glimpse of Mike through Anthony Bourdain’s Parts Unknown, when it airs tonight, but as 100 Days in Appalachia likes to remind our readers … there is always more to the story. 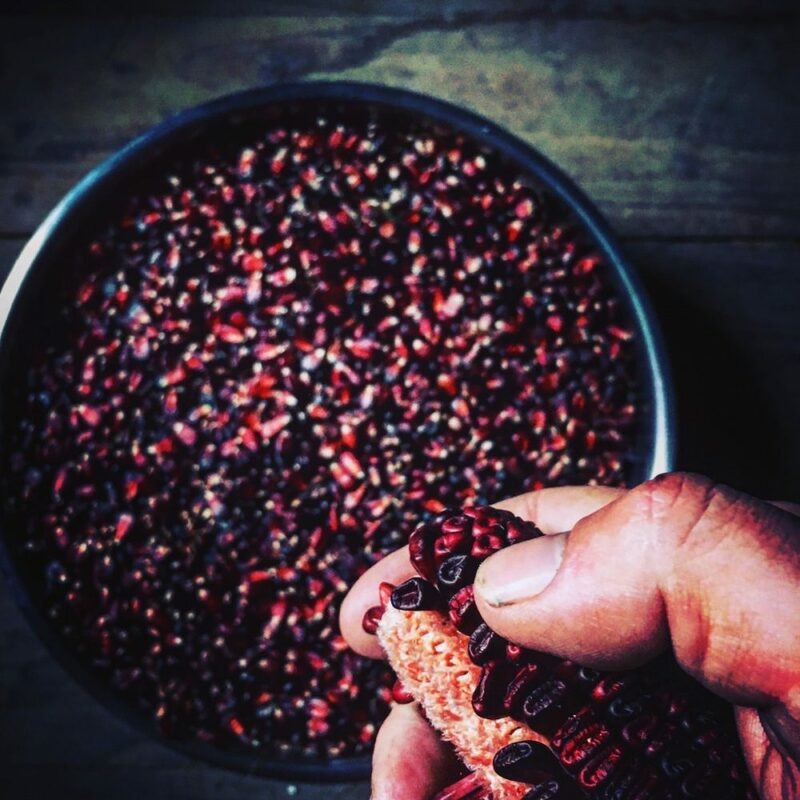 Here Mike talks about his experience with “Parts Unknown” and shares his unique vision for what he’s dubbed “The Seed Swap,” a collaborative way to tell Appalachia’s complex economic, political, cultural and human stories through food. 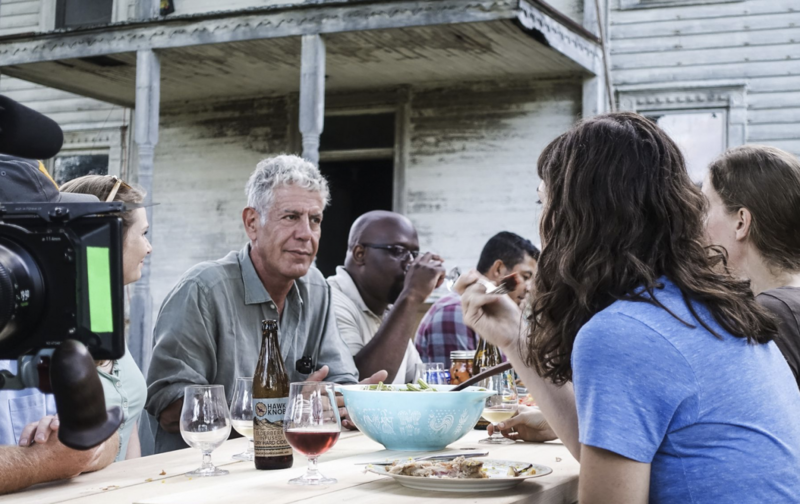 On an episode of CNN’s “Parts Unknown” earlier this year, Anthony Bourdain spends a few minutes at Lost Creek Farm, and a somewhat surprising interaction between the two of you was featured on the show. Can you tell us about it? It’s hard to explain, but when something like this happens, you’re not just basking in publicity overnight. Sure, it’s an honor to feel like people are paying attention to your work, but it’s all pretty stressful, actually. When you’re from a place that’s been so consistently misrepresented, you feel a tremendous weight on your shoulders any time you’re picked out to represent the state and the region. In a way it’s kind of silly, because it’s out of your hands. It’s up to the editors and producers to decide how the story is framed, but you still want to do your best to make people here proud. You try really hard to tell a story that’s not just your own, but reflects some of the nuance and complexity that’s typically overlooked. It’s all a very heavy lift. Lou and Jessie Maiuri, with Anthony Bourdain, at Lost Creek Farm during a taping of CNN’s “Anthony Bourdain: Parts Unknown.” A master seed saver, Lou, 88, passed several varieties of pole beans down to Mike Costello to grow at Lost Creek Farm. Photo by Mike Costello. Since September of 2017 when we shot the episode, as I’ve been thinking about this show, I’ve become very much aware of the pressure we put on ourselves when something like this happens. It’s so rare that national media asks us to tell our own stories, rather than showing up with a preconceived narrative and picking out characters to fit. But the reality is, even with a thoughtful, respectful production team, it’s impossible to fit every story that deserves to be told into an hour-long show. “Parts Unknown” gave us an opportunity to tell a few stories we don’t normally get to tell on national television, but it’s still incomplete, and that’s what we should expect. I think sometimes we fall into this trap, feeling like every news story or profile of Appalachia should encompass everything we like and nothing we despise about this place. Obviously that’s not realistic, and it just adds to the pressure we put on ourselves. I guess you could say one of the goals of “The Seed Swap” is to alleviate some of that pressure by providing a consistent outlet for homegrown stories. If there’s an article or video that didn’t include certain people or themes, let’s write another article, let’s shoot another video. Let’s add to the conversation and point to the body of work we’re willing to establish through conversation, rather than looking at each story as a high-pressure, get-it-right-or-else scenario. What originally spurred this idea of launching a food and culture publication with 100 Days in Appalachia? Why is storytelling so important to your work with food? I think to really grasp my passion for storytelling as it relates to food, you have to understand what it’s like to grow up with derogatory portrayals of the region in your face as part of everyday life. I’m not just talking about media, although stereotypes were and still are very much present on television and in the movies. I’d see these things all around me growing up. I remember going to gift shops in or around state parks and seeing trashy kitsch like single toothpicks wrapped up with labels that said “West Virginia Toothbrush” or little figurines of barefoot, toothless moonshiners. Even through these hokey trinkets, we were telling a story about who we are to the outside world. In turn, we’re also telling that story to ourselves about how much we value our own cultural assets. Jonathan Hall gathers wild paw paws during the “Parts Unknown” shoot at Lost Creek Farm in September 2017. Photo by Mike Costello. We all process these narratives in different ways. There are plenty of people I know who, because of the negative connotations around Appalachian identity, moved away and left every morsel of association with the mountains behind. I can’t really say I blame them. But for me, all of those stories inspired me to chip away at telling different stories, with the hope that one day we might be perceived differently, and that young people in Appalachia won’t have to do a risk/reward analysis over embracing place-based culture and heritage. There are a lot of us out there now, in organizations like the Appalachian Food Summit — a broad network of chefs, farmers, food writers, food justice advocates and so many others — who are sort of on this mission to flip the narrative, and make the story about Appalachian food is one about strength and resilience, rather than shame. I think there’s a lot of good that’s possible when we take food heritage, something we’ve been conditioned to run away from in some sense, and turn it into a source of pride. This is something we put a lot of thought into for months. We wanted something that transcended racial and ethnic lines, which can be tough with food. There are certainly dishes that have more cultural overlap than others, but when we looked at certain dishes, ingredients or cooking and preservation techniques, some of them sounded pretty catchy, but with most of those we felt they left people and communities out. That’s the opposite of what we wanted to do. Somewhere in the brainstorming process, “The Seed Swap” emerged as a candidate and it really just seemed to fit. Seed swaps occur when farmers and gardeners get together to share seeds that have been saved, sometimes for many generations. Whether it’s only two home gardeners or a hundred farmers and homesteaders participating, these events represent a sense of community I’ve always considered a trademark of mountain foodways. But seed swaps really go beyond the sharing of seeds, because folks are also sharing tips and tricks they’ve learned for growing certain varieties, and they’re sharing the rich stories behind the crops themselves. Essentially, a seed swap is an exchange of ideas, opinions, information, stories — and that’s what we wanted our publication to be. How is the name “The Seed Swap” universal? If you look at the crops that are most closely associated with Appalachia today, even what we grow on our own farm: Fat Horse and Logan Giant pole beans, Bloody Butcher corn, Cushaw and Candy Roaster squash, they have deep roots in Appalachia and Mesoamerica before that, long before the arrival of white settlers. Throughout history, there’s been a tradition of knowledge sharing here. I think a lot about the waves of immigration into the coalfields. You had people from different backgrounds sharing knowledge and resources over gardening to survive. During the mine wars, African American families who left sharecropping arrangements and former Eastern European farm workers were segregated in many ways, but they came together to share knowledge and resources, including seeds, as an expression of solidarity. They grew and preserved food together. Those gardens really became a tool of empowerment when they had enough food on hand to extend miners’ strikes and achieve historic victories for the labor movement. I’ve also witnessed the way seeds have provided entry points into deep conversations that allow us to discover common ground. Last year, I got to hang out with some folks from Oaxaca. When they saw these varieties of bright red and blue corn we were working with, their eyes just lit up, and they started talking about corn from back home in Mexico that looked identical to the varieties we call Bloody Butcher and Blue Clarage. All of a sudden, what started out as a conversation about seeds became a broader exchange about people and place, and that was very special. Lorelei Tenney bottles freshly boiled sorghum syrup in Tallmansville, West Virginia. Originally from the Philippines, Lorelei and her husband Donnie, a Tallmansville native, grow and process several acres of sorghum cane each fall. Photo by Mike Costello. Over the past several months we’ve been building a team of incredibly thoughtful, talented contributors who’ll be working to produce content in a variety of media. I love sitting down to read great writing, for sure, but I really want to look at how we can use other media, too. Of course, video and audio make sense, but what are some other ways we can tell stories? We have some ideas. Stay tuned. Can you give us some examples of what that would look like, to look at broader issues through the stories about food or farmers or chefs? One of the issues that comes to mind for me is access to affordable healthcare. That’s not always something people connect to food, but there are a lot of farmers and entrepreneurs who are only able to do what they do because health insurance suddenly became affordable within the past five years. Now, when we’re looking at perpetual threats to dismantle the Affordable Care Act, there’s a lot of worry and uncertainty among farmers and independent business owners about where they’ll be next year. Recently, I read an op-ed from a very conservative state official who said we needed more full-time farmers in West Virginia. That would be nice, but unless affordable health care and other facets of a certain social infrastructure are in place, it’s unrealistic to think that’s a possibility. Another issue I think about a lot, especially this time of year during ramp season, is how extractive industry affects foodways. Right now we’re looking at several major pipeline corridors, some of which will end up in the middle of working family farms, treasured hunting grounds and ramp patches foragers have been frequenting for almost their entire lives. We’re hearing a lot about the economic boost from pipeline construction, but what do farmers and foragers stand to lose? Who’s telling their stories? Jonathan Hall carries a freshly killed and dressed deer following a hunt at Lost Creek Farm in November 2017. Hall wrote about his experience as a black hunter in West Virginia for “Explore Parts Unknown.” Photo by Mike Costello. “The Seed Swap” will be a publication that largely focuses on Appalachian food, but what, exactly is Appalachian food? It’s a tough question, and I’m not going to answer it. “The Seed Swap” won’t make an attempt to define it, either. I always say, Appalachian food is up for interpretation, because our experiences as Appalachians vary too widely to arrive at a point of consensus. I know what it means to me, and I know how the people around me have shaped my experience, but Mike Costello’s story is not the story of Appalachia. Heck, if you just talk to ten families in North Central West Virginia, you might get ten different answers as to what Appalachian food heritage means, and you’d get another ten answers about how today’s Appalachian food has evolved. It will be interesting to dig in and explore those differences, painting a broader picture of regional identity than many would expect. Aside from exploring how we each define “Appalachian,” I hope we can look at food as more than just a combination of flavors and ingredients. These stories are really about people doing amazing work, whether around diversity and inclusion, economic development, food security and a host of other critical issues facing the region. When people hear “Appalachian food” now, they typically think of dishes they consider to be emblematic of the region’s cuisine. I’d like for the associations with Appalachian food to be about the people behind foodways work in the region, just as much as the food itself. As a chef and journalist, I want to create an outlet that stops short of defining exactly what Appalachian food is, and recognizes that our foodways are constantly evolving with an ongoing shift in social demographics. Most importantly, I want it to legitimize Appalachians as the storytellers of our region. I don’t want to create an environment that discourages others from seeking out stories or discovering our traditions. In fact, some of the most thoughtful, sensitive, community-minded work around Appalachian food and culture is done by folks who came here as outsiders, yet they show this unwavering commitment to the region that deserves recognition. At the same time, I think there’s room to look at certain interpretations of Appalachian identity, especially when they’re commodified for economic gain outside the region, with a critical eye. Going back to the original mission of 100 Days in Appalachia, we’re very much interested in creating an outlet for stories about Appalachians, told by Appalachians. Last Friday morning started out well within the realm of the ordinary. Just before 7 a.m., I walked downstairs, put the coffee on and headed to my desk to make a to-do list for the day ahead. As I looked out the window of my home office and watched the fog rise from our bottom meadow, I drifted back to a conversation from the previous night. It was one I had with several friends about the time Anthony Bourdain visited last September, filming a scene for Parts Unknown. I’ve offered up some combination of those answers dozens of times by now, often just before pivoting away from Bourdain himself, to the fair and honest way I thought Parts Unknown represented the Mountain State, or how I hoped our segment might play a small role in celebrating Appalachian food, something my earliest culinary mentors thought belonged in the garbage, not on television. I never minded talking about Bourdain, but my responses seldom matched the enthusiasm of those who’d ask with the widest of grins and a gaze of the over-enamored. When I got the call about Parts Unknown last summer, I knew enough about Bourdain to respect him, but I never embraced the fanaticism he seemed to attract. I hadn’t read his books, and having lived without a cable subscription for the past 15 years, I’d only seen a handful of his shows. While I appreciated Bourdain’s knack for telling underdog stories and digging beneath the surface in his travel destinations, my own limited exposure gave me few reasons to be enthralled by a celebrity with whom many seemed to have a wildly unhealthy obsession. We were in the front yard Thursday evening when someone asked what Bourdain had to say while he was at the farm. It’s a question to which there are dozens of potential answers, in both on-camera and off-camera categories. But what I chose to share that night, and what was on my mind the next morning, was what Bourdain repeated while sitting at the dinner table just across from my partner Amy and I, under the canopy of giant sugar maples, as he sipped on hard ciders and poked fun at Brooklyn hipsters. Facing the same meadow I can see from my office window, he’d remark just how beautiful West Virginia is. There were, of course, on-camera and off-camera versions of this statement, as well: “West Virginia is so beautiful,” and “Man, this place is f—ing beautiful.” It was obvious neither lacked sincerity. Throughout the morning, I’d open Facebook and Twitter, each time more astounded by the hundreds of posts reflecting a widespread outpouring of grief. Personal, revealing, vulnerable in tone, these were no run of the mill tribute memes that tend to flood the social mediasphere when notable celebrities pass away. Before long, I realized my short-lived experience of hosting Bourdain meant so little compared to the intimate relationships some of my good friends and food industry colleagues shared with him for years, even if they’d never met in-person. Welsch was raised on a dairy farm in the Northern Panhandle, his father a laborer in a glass factory, later in an aluminum mill. He said while the episode didn’t necessarily reflect his own upbringing, he could identify with and take pride in the stories Bourdain told. At a very young age, years before AuCo Lai imagined moving to what she calls her adopted home of Appalachia, she struggled with cultural identity, experiencing the ridicule and intolerance Bourdain so often spoke out against. Lai, now a sous chef at The Wrigley Taproom in Corbin, Kentucky, is the first American-born member of her family. Her parents, both refugees from the Vietnam war, attempted to impress an appreciation for Vietnamese culture upon their young daughter. But in their suburban New Jersey neighborhood, they struggled to balance Vietnamese culture with American norms and ideals Lai was exposed to around her young friends and classmates. “It was actually a real source of pain for me during my adolescence,” she said of the cultural tension. At some point in her early teens, an interest in food led her to follow Bourdain’s travels on television. When he ended up in Vietnam for two consecutive episodes of the Food Network series A Cook’s Tour, Bourdain made her feel comfortable embracing her family’s heritage for the very first time. In 2012, while living among a large Vietnamese community in Minnesota, Lai suffered through a challenging bout with depression. In a moment when, she says, Bourdain “saved me from some of my darkest moments”, she read Kitchen Confidential and realized she wanted to turn her affinity for cooking — more specifically, Vietnamese cooking — into a career. Once she finished the book, she quickly picked it back up and read it again. In the Appalachian foothills of Eastern Kentucky, Lai says she feels a special bond with her friends and neighbors, many of whom struggle with stereotypes, cultural identity and mental illness. She says such deep, empathetic connections solidify her decision to stay in Appalachia, passing up recent opportunities to earn more money in larger cities like Lexington, Louisville or Chicago. “Conflicted” would be one way to describe the experiences of Blair Campbell, chef and owner of Pretty Penny Cafe in Hillsboro, West Virginia. For almost twenty years, Campbell has watched Bourdain, who, she says, inspires the way she travels, the way she interacts with the community, the way she’s strived at times to become a voice for the voiceless. She said she appreciated the way Bourdain ended up off the beaten path, telling stories about people and places most celebrities and television hosts would never think to visit. Campbell says Bourdain could “always see the good in a place, but he wouldn’t sugarcoat it,” pointing to the uncomfortable conversations Bourdain tried to spark about issues such as race, women’s rights and gentrification, to name a few. Last month, when asked which issues Campbell wished Bourdain could highlight if he were to someday return to West Virginia, racism in her community was at the top of her list. It’s a deeply personal issue for Campbell and her family. Her husband, Charlan, a native of Jamaica, and the couple’s young children, Oliver and Penelope, are some of the relatively few people of color in rural, sparsely-populated Pocahontas County, which, according to 2010 census data, is almost 97% white. The National Alliance, which the Southern Poverty Law Center says was “for decades the most dangerous and best organized neo-Nazi formation in America”, was once headquartered just a couple miles from Hillsboro. Some of its members and relatives of former leaders still live nearby. In 2014, Pretty Penny was vandalized by a disgruntled former employee’s acquaintance, who had spray-painted a racial slur on the building’s white wooden siding, an incident to which the community responded with a vocal outpouring of support for the Campbells and the cafe. Campbell says while racism shows up in everyday life, it’s an issue residents are hesitant to discuss openly. That is certainly not a dilemma unique to Pocahontas County, or anywhere else in America. She says the conversation isn’t as simple as identifying victims of racism, or accusing others of racism, because in small, rural communities like Hillsboro, residents with drastically varying backgrounds and ideologies interact with each other routinely. They send their kids to the same schools and babysitters, support each other’s businesses, and, in many other ways, rely on each other to survive. The dynamic is nothing, if not conflicted. Although it will never be Bourdain facilitating, she hopes such a dialogue is still possible. She says, while he could have started the conversation, it would have been up to the community to keep it going. Starting this week, Campbell says she’ll start airing past episodes of Parts Unknown each Wednesday evening, hoping the conversations Bourdain had in communities around the world might inspire residents of Hillsboro to sit down together, share a meal and start talking. Anthony Bourdain gave me some exposure. For that, I’m grateful. But what he’d already granted me, a cohort of supportive peers inspired to embrace their heritage, bring communities together and take up for the little guy — that’s more valuable than I’ll ever reap from several minutes on national television. While I’ll never be able to repay him, I’ll certainly be spending some time under the maples in the front yard, looking out over the bottom meadow, pondering how I might begin to pay it forward.